Hi all! Since my last blog post I have been developing my idea to open my own cafe, a dream that I have had from as far back as I can remember. Obviously I will want to serve hot beverages including tea and coffee, but I have been mulling over which food would be best to offer. I want my cafe to have a contemporary feel about it, so I’m not planning one serving the classic “greasy spoon” menu of English Full Breakfast and sausage, egg and chips. That is not my style and totally contrary to view on healthy eating. But at the same time, I don’t want the menu to be over complicated or fussy. So I have decided that the best food to build my menu around is the humble sandwich! Whether it be cold or toasted, on bread, panini or ciabatta, you just can’t go wrong with a good old sandwich. Humble cheese and tomato or sophisticated spinach and feta cheese, they’re all good in my and, hopefully, my customers eyes! So in this blog post I am going to talk about some of my favourite sandwiches that I intend to put on my menu and the various equipment I will need to prepare them, such as a good quality carving knife, panini press or sandwich toaster. You can find a sandwich toaster for sale online. In fact that is the perfect name for my cafe. “The Sandwich Toaster”! Done! A french classic! This is one of my favourite sandwiches and will most definitely be on my menu. Garnished with some sliced tomato and with lashings of mayonnaise, this makes a delectable meal for anytime of the day. When a good quality cheese, such as Beaufort, and a high end roasted ham, such as Jambon de Bayonne, are amalgamated, the compliment each other perfectly. A good English Cheddar and York ham would work together equally as well on the other side of the Channel. Simple, humble yet downright tasty food! Hailing from Philadelphia in the United States, this sandwich needs no introduction. 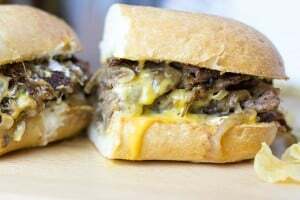 Best served on an Italian Ciabatta, it combines choice cuts of tender beef steak cooked to your liking with the sweetness of fried onions and the richness of a good Italian cheese such as Provolone. Green pepper are also a great addition. This would of course be at the top end of my menu price wise, but it is proven popular choice with which you just can’t go wrong. Best served on sliced granary bread, this is a classic combination best finished with a crisp lettuce leaf and lashings of green pesto. The creaminess of the avocado is the perfect compliment for the juicy chicken breast. Not quite as decedent as the steak sandwich and somewhat less heavy on the calories the ham and cheese, this sandwich will appeal to those looking to maintain a healthy balanced diet, especially if you forgo the pesto. So there you go folks. There are the first three items that will appear on my menu when the time comes to create it. I have a friend who owns an industrial printing machine who will be happy to knock them up for me (the menus, not the sandwiches that is) further reducing start up costs. I’ve got so many more sandwich combinations in my mind (bacon and halloumi cheese, yum!) But we will get around to them in a future blog post as I think I’ve probably given you a bit overload today. Until next time folks!